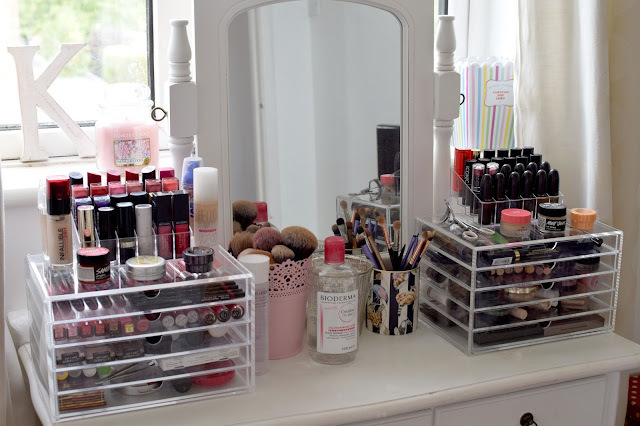 This post has been a long time coming, but I eventually got my makeup storage just how I wanted it and I'm actually really happy with it, so I thought I would share it and tell you a little about where I bought certain things etc. 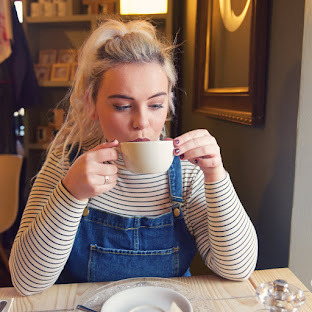 I love being nosey and looking at other peoples collections so I hope you enjoy mosying around mine! I'll start off with my dressing table, I got the table itself, mirror and stool on eBay, it was only about £150 for all of that so a real bargain, we just had to attach the legs when it came, so not totally flatpack like Ikea so it's a little easier. I can't find the exact link but there are lots of similar ones, I wish I'd gone for one with one long draw instead of two as they're a bit awkward to fit things in. 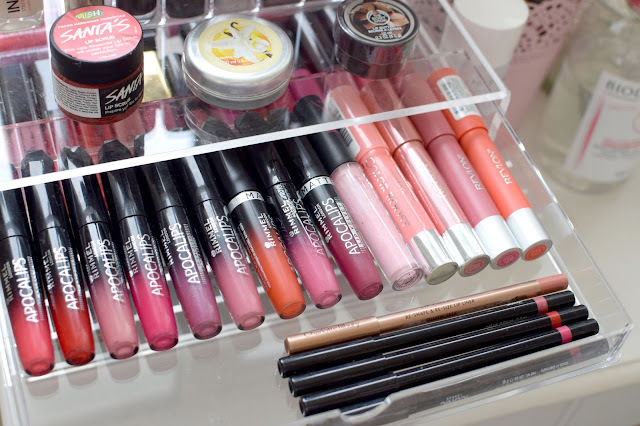 My acrylic drawers are the the 5 Drawer set from Muji. They were £24.95 each so a little pricey but totally worth it, they're super spacious, also if you google Muji promo codes I always find some for at least 10% off! The two acrylic lipstick holders are from eBay, they were about £2.60 each, total bargain but they take a while to come since they're from China. Onto my brush storage (sorry they're so dirty!) the pink container that everyone and their grandma has is from Ikea, the silver pot in the middle that I keep cotton pads in is also from Ikea. My eye brushes are in a gorgeous pot from House of Hackney and was £24, I think it's supposed to be for toothbrushes but I loved the design, funny animals doing quirky things! As you can see on the top of my drawers I keep my lipstick collection, as well as foundations which don't fit in the drawers, eyelash curler and some lip balms and scrubs, my faves are from The Body Shop, Nuxe and Lush. My actual dressing table drawers are a mess but they've got all my eyeshadow palette in! 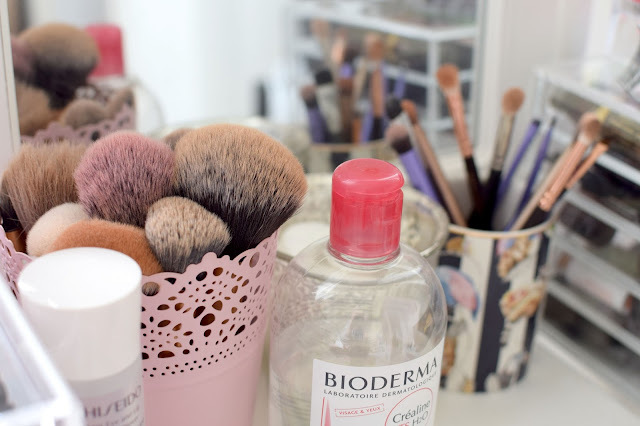 I've been using Bioderma to remove my makeup and also the Shiseido remover. Diving into some of my draws I've got a ton of Rimmel Apocalips, some Revlon balms and some lip liners, in love with Charlotte Tilbury Lip Cheat! Next I've also got some lip glosses, I love the Tanya Burr ones, I've also got some from Milani, Marc Jacobs and Iconic London. 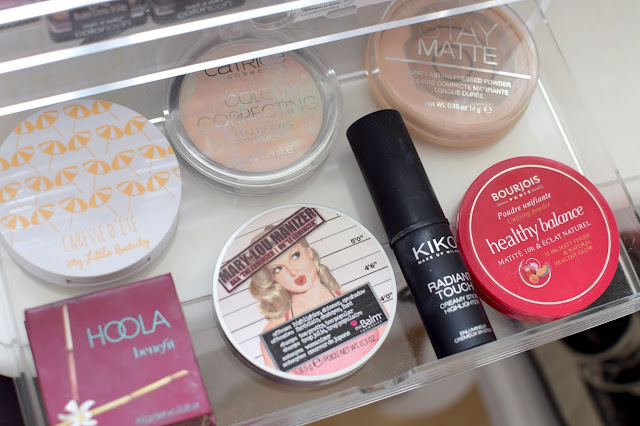 Next into my powder/bronzer and highlighter drawer, I'm still obsessed with The Balm Mary-Lou Manizer, I love the Bourjois Healthy Balance Powder too. From Kiko I love their Radiant Touch Highlighter, also their bronzer which is in my dressing table draw because of its massive wooden packaging! 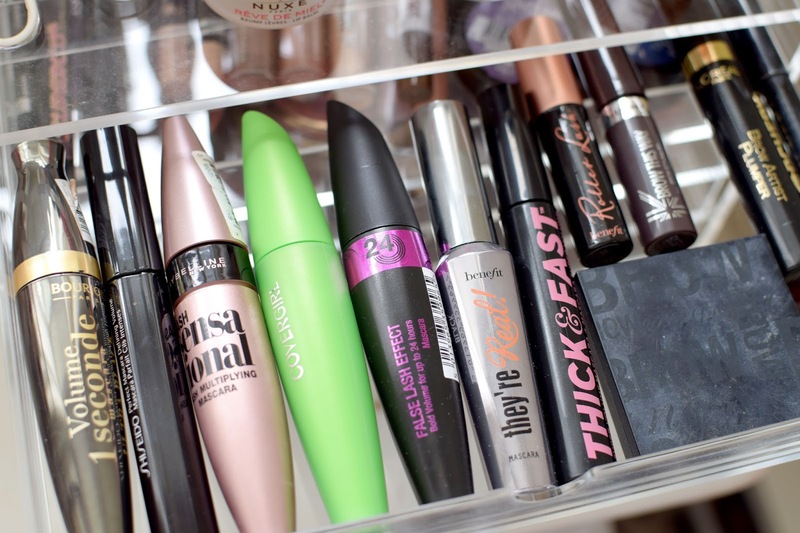 Then we have mascaras and eyebrow stuff, Maybelline Lash Sensational is one of my faves, for brows I love Rimmel Brow This Way mixed with Soap & Glory Brow Archery. 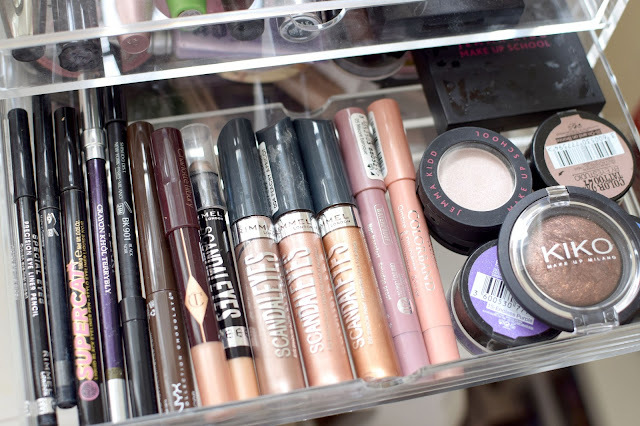 Then some eyeshadows and eyeliners, love the Maybelline Colour Tattoo's and the Rimmel Scandaleyes. My go to liquid eyeliner is Soap & Glory Supercat. 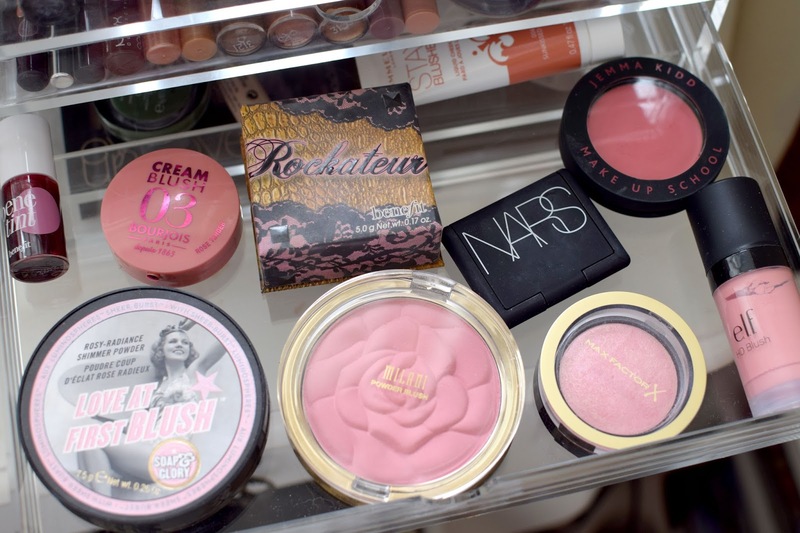 Finally onto blushers, I'm loving the Milani blushers right now, also the Max Factor Creme Puff Blushes are fab! 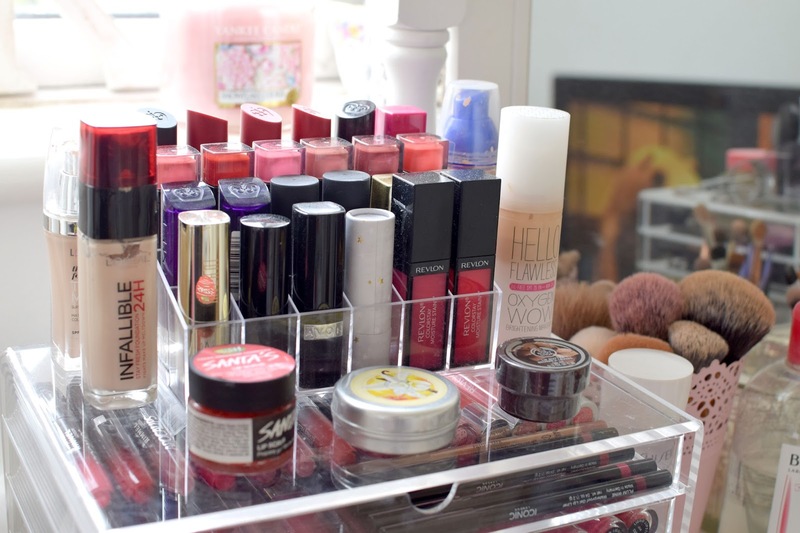 What's your makeup storage and collection like? 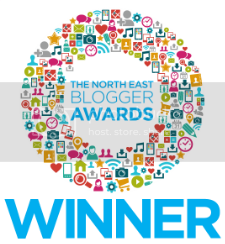 If you have a post please link it below, I'd love to take a look! I have severe collection envy. The photos were so good and really clearly showed what was in each drawer- love it! 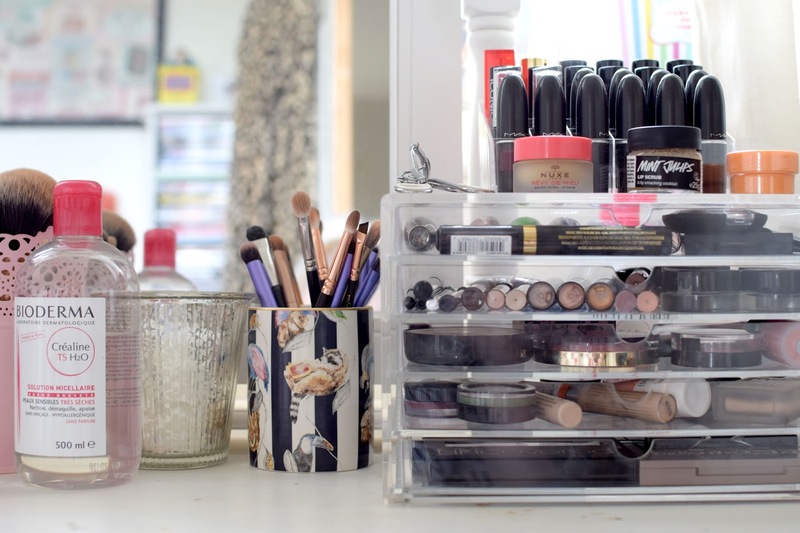 I love reading about collection and storage posts and adore your storage! :) I really need to invest in more Muji, especially when I move out as currently my vanity is against a sloped wall which means I can only get away with the two drawer storage.